Coastal design schemes are perennially popular for good reason – a trip to the beach for most of us is a time of tranquility and enjoyment, having left our work and day-to-day stressors far behind. It’s no surprise that so many of us would love to recreate that feeling at home. Even if you are land-locked, it’s possible to capture a relaxed coastal vibe with a well-executed design scheme. The key for creating a successful coastal decor, however, is found in the phrase “well-executed.” It takes a good plan and a refined sensibility to capture a kitsch-free authentic beach style. Here are a few key design ideas and tips to help you cultivate a coastal look that’s smart and sophisticated. 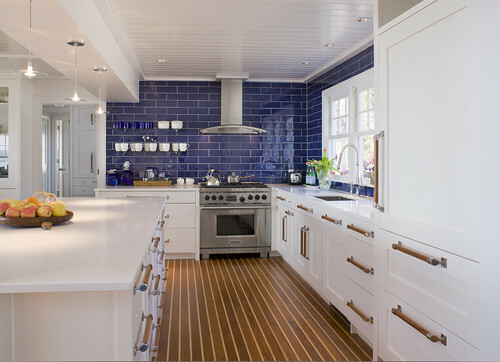 While this contemporary kitchen has a strong nautical theme with cobalt tiles paired with a yacht-like wood floor, white Shaker cabinets, and steel and wood hardware, the look is sleek and sophisticated – far from kitschy. Keep interiors light and bright. Coastal-style interiors should evoke a relaxed, casual and effortless feel, so keep the interiors pale, breezy and mix up your neutrals. 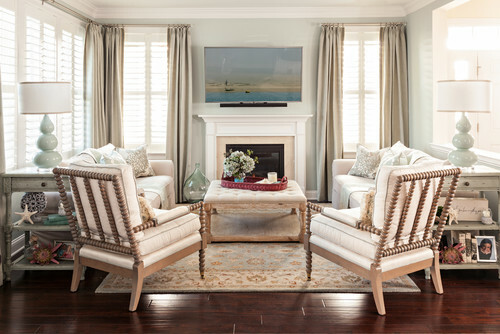 The combination of neutral creams, browns and soft blues in this space really channel the essence of seashore colors, while the plantation shutters add a casually elegant touch. Contemporary Living Room by Miami Interior Designers & Decorators DWD, Inc. 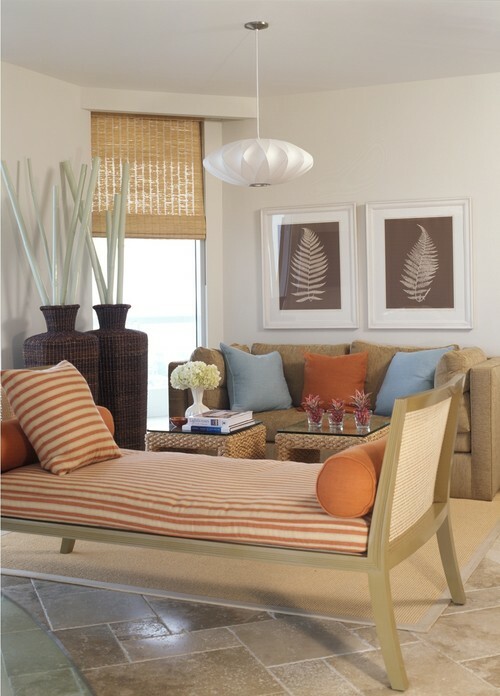 The key to not going overboard in coastal decorating is to use lightweight fabrics like linen and use natural materials like raffia and other materials with a woven look and texture. 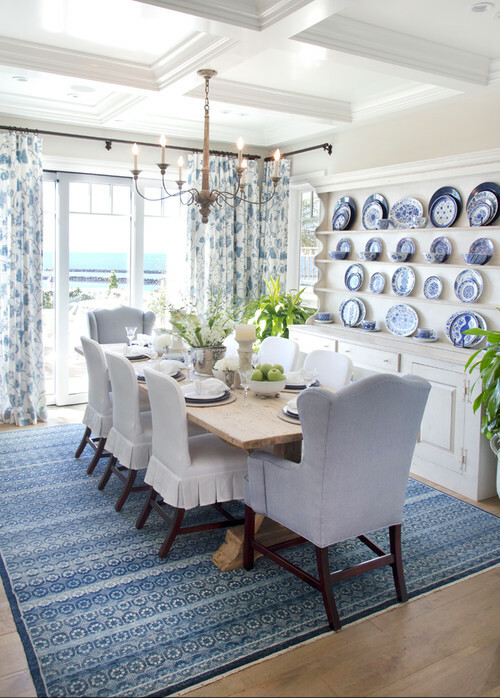 Nothing says coastal like a crisp blue and white color scheme! 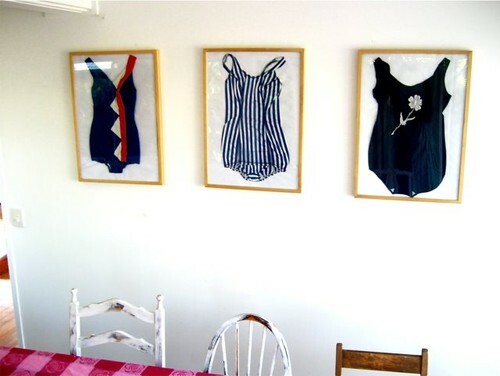 A collection of framed vintage bathing suits is an unexpected and fun (if a little quirky!) way to give your space a beach vibe. Pale aqua accents and painted floor paired with lots of sandy neutrals make for a light and airy master bedroom that’s high on seaside charm. 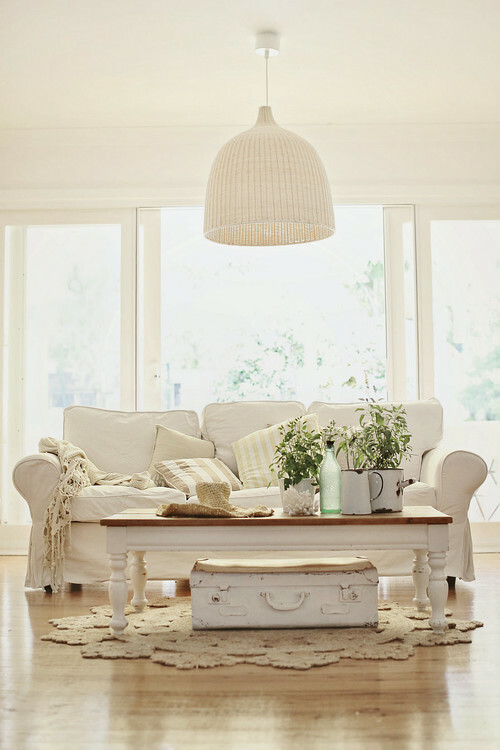 One of the keys to a relaxed coastal style is a lack of clutter, so coastal style spaces should be relatively simple. 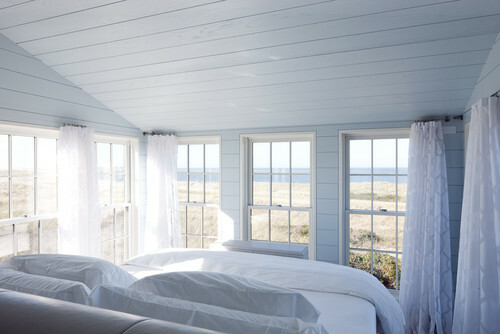 This unembellished bedroom is light, airy and tranquil–letting the views from the window serve as the focal points. Crisp white accents and white billowy curtains against the chalky blue walls create a soft yet, opulent feel. 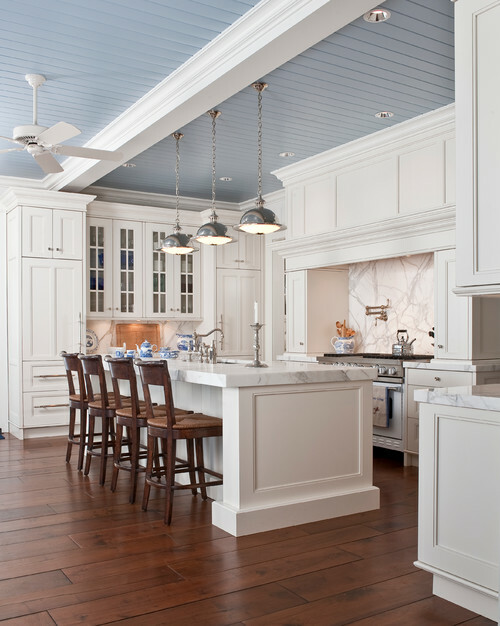 Crisp white cabinetry paired with a blue beadboard ceiling lend a coastal feel, while the marble countertops add a touch of elegance. The kitchen perfectly captures the relaxed beach house vibe. 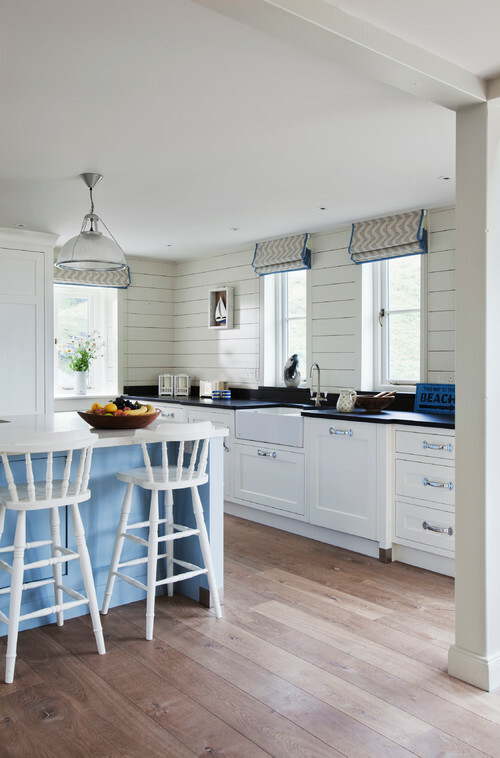 The soft lines of the country-style accessories enhance the Shaker style cabinetry, while the neutral palette peppered with soft blues references coastal surroundings. Beach Style Bathroom by Miami Architects & Building Designers Village Architects AIA, Inc. The bathroom with gray-washed wood plank floors, walls and ceilings might just be the epitome of coastal cottage style. The monochrome gray tones, marble cabinet tops and plantation shutters lend the space a sense of understated elegance. 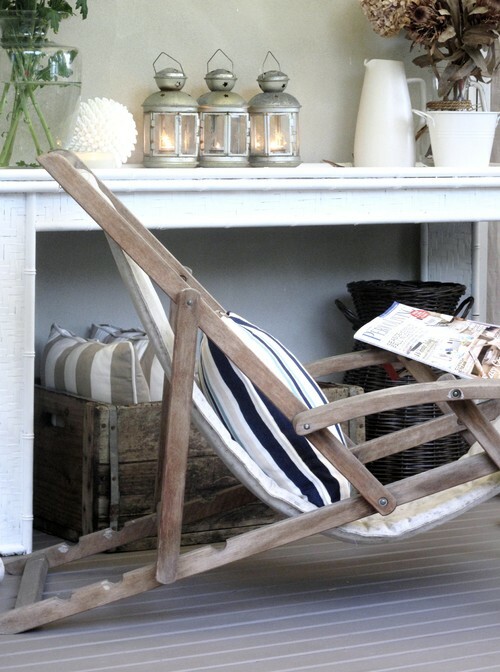 For more beachy decorating ideas, check out our “Go Coastal” Pinterest Board. Prestige Marble and Granite can help you bring your coastal decor to life with the organic, earthen beauty of natural stone. We offer an exciting selection of designer natural stones, as well as a large variety of core colors, to complement any design project and any budget. Stop by our indoor showroom anytime; we’re here to help you every step of they way – from selection and layout through fabrication and installation. Beautiful weather begs us to do more outdoor living and entertaining – and the trend for incorporating outdoor living spaces, including outdoor kitchens, has never been greater. If you’re thinking of installing an outdoor kitchen, you ‘ll want to consider your lifestyle and the way you entertain, in addition to space constraints and budget. Here are some tips to help make the most of your new outdoor space. – Use durable materials, such as stainless steel and natural stone, and check with your supplier to ensure that the materials you select are recommended for outdoor use. 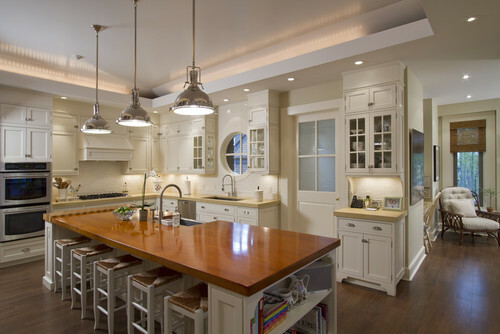 – Make sure you have adequate task lighting and plenty of counter space. Poor lighting and skimpy counter space will make for a less than ideal cooking environment. – Include a shelter that protects from the elements. A shelter will also make it easier to install helpful ventilation and air flow, such as a ceiling fan and/or ventilation hood. – Choose a flooring material such as porcelain or stone tile that is easy to clean and will stand up to dirt and debris. You’ll want to make sure the flooring has adequate traction, because it will get wet, even if sheltered. 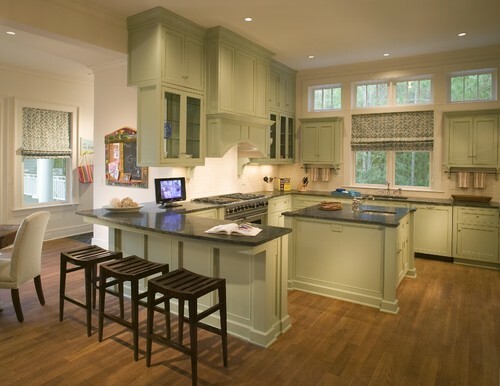 – Consider connecting your outdoor kitchen space to the house on one side for added shelter from wind and weather. This might also provide the possibility of a pass-through window for easy transportation back and forth. 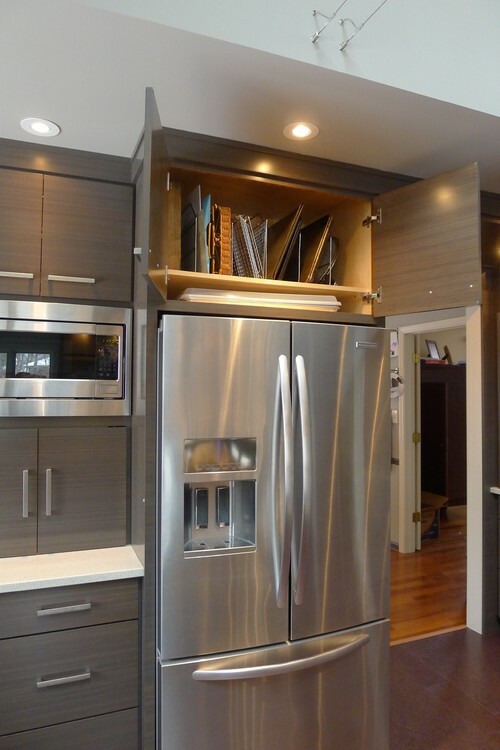 – Include a space for seating near the cooking area so the grill-master can interact with the guests. – Consider the power of small appliances and don’t skimp on appliances that will really make a difference. You might want to invest in that jumbo grill, for example, if you entertain large crowds frequently. And depending on your lifestyle, small appliances such as a mini fridge, ice-maker, or blender could make a big difference. For inspiring outdoor kitchen ideas, head over to our Pinterest Board! Prestige Marble and Granite has the countertops you need to help make your outdoor kitchen a success. 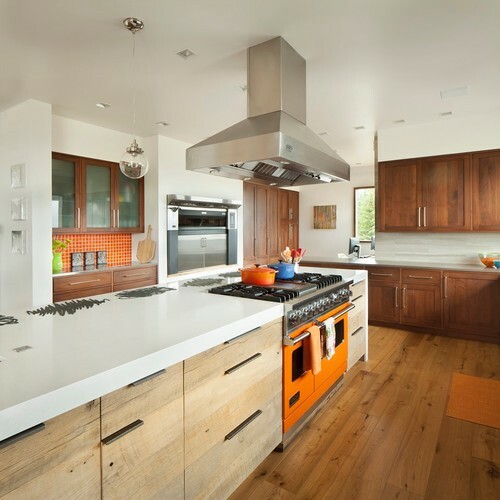 We offer an exciting selection of designer natural stones, as well as a large variety of core colors, to complement any design project and any budget. Stop by our indoor showroom anytime; we’re here to help you every step of they way – from selection and layout through fabrication and installation. The classic color combination of black and white can make any room feel unquestionably sophisticated, chic, and effortlessly elegant. While nothing quite makes a statement like black and white, this simple color scheme is not exactly fool-proof. So, how do you decorate with black and white? It’s important to first determine how you want the room to feel. Consider what kind of effect you want. Some good words that describe the different atmospheres a room can emanate are: calming, dramatic, elegant, sophisticated, classic, chic, playful, whimsical, soothing, and cozy. Next, do your research. Design magazines (online or print) are great resources for inspiration, as are websites such as Pinterest and Houzz. Instagram has become the darling of design world, so that’s definitely worth checking out. Also, look to your local interior design shops to find ideas. Art museums and the fashion runway are excellent sources for inspiration, too. To avoid an unconnected, chaotic look, it’s important to plan ahead, but the most important thing to remember is that you must be ready to make a strong statement or your black and white scheme will fall flat. 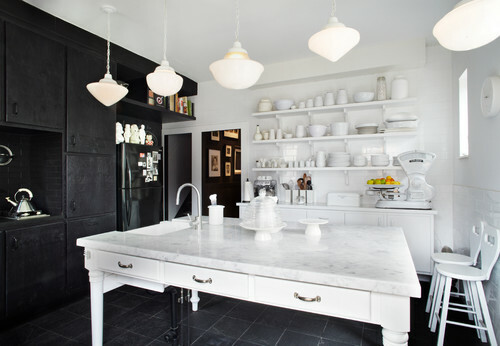 Here are some tips and ides for successful decorating with black and white. A bold, high-contrast black and white design can instantly add interest to an otherwise basic space, but be sure to keep other accessories simple to allow for maximum visual impact. 2. Add a third pop of color. This room has not one, but three, different patterns in black and white. By changing the scales of the different black and white patterns in the space, the room remains cohesive without going overboard. 4. Buy all white or all black accessories. With the exception of throw pillows, accessorize with all black or all white pieces for flexibility. You can choose to mix them, or switch out your displays for all white items or all black items, which gives you three different looks. 5. Go for the unexpected! 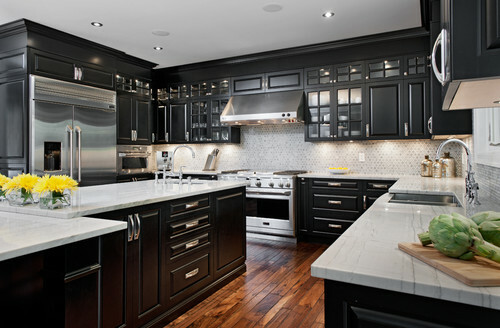 The classic black and white kitchen usually sports white cabinetry with black as a secondary color. Give your design an unexpected twists by flipping it around to create a unique look that is just as timeless and elegant as its reverse counterpoint. For more Black & White inspiration, visit our Pinterest Board! Whatever color scheme you choose, Prestige Marble and Granite has the countertop you need to help make your design dreams come true. 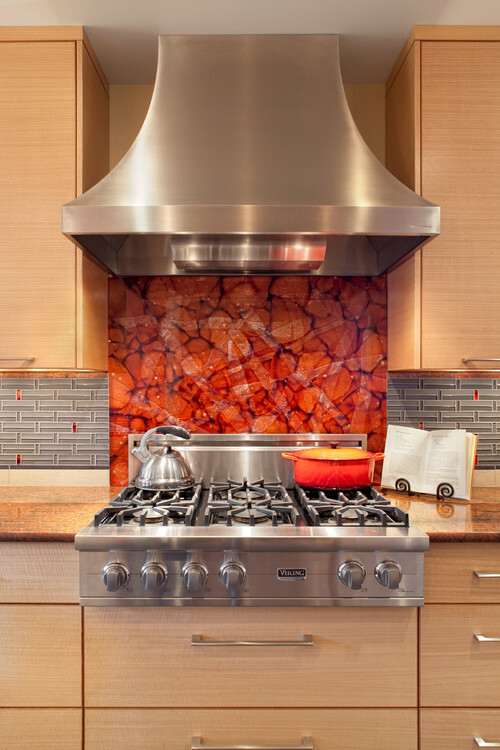 We offer a large selection of exotic and rare natural stones to complement any design project. Stop by our indoor showroom anytime; we’re here to help you every step of they way – from selection and layout through fabrication and installation.